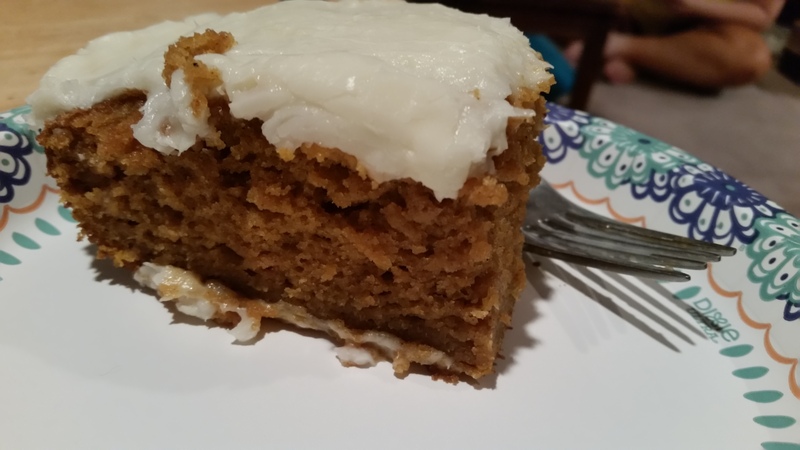 Perfect Pumpkin Bars with Cream Cheese Frosting – What's for Dinner Moms? We made these to have on hand around Thanksgiving and they were so simple to make. I thought they would make a great pairing with a hot cup of coffee or hot cocoa. These are not too sweet but have a delicious flavor when you want something just a bit sweet. These are very dense and have almost a custardy feel to them. They were delicious! They are so moist. We even brought a couple of slices to Chicago with us for a friend. She immediately opened the container and finished two large slices. She kept saying how good it was. Preheat oven to 350 degrees. Spray a 13 x 9 pan (for thicker bars) or a jelly roll pan (for thinner bars) with non-stick spray or butter and flour. In a large bowl whisk together oil, eggs and sugar. Add flour, baking soda, baking powder, salt, pumpkin, cinnamon, and nutmeg to the bowl. Beat until smooth and well blended. Pour into prepared pan. Bake 25-30 minutes (jelly roll pan) or 40-45 minutes (13 x 9 pan). When center is done remove from oven and allow to cool. Once cooled make frosting by beating together all ingredients. Spread evenly over bars. Cut into bars once frosting has set. These look delicious! I’m doing lots of baking on Saturday so I think these will have to go on the list!! Thank you! Hope you like them. Does anything not taste good with cream cheese? Lol! Thanks, I totally agree! Thank you so much, Erika. I thank you for all of your delicious inspiration, Marci!! I would gobble this up! I’m making these over the Christmas Holiday. I’m pretty sure Big Baby Boy, and He-Man would gobble em up too. Baby Girl, Dark Haired Beauty, and #1 Grandson…hum. We’ll turn em! LOL! How cool that she is in the Miss America pagent! I am not a big pumpkin fan but these were really good. These look jolly nice, Marci. Pingback: Sunday Cinnamon Rolls – What's for Dinner Moms?